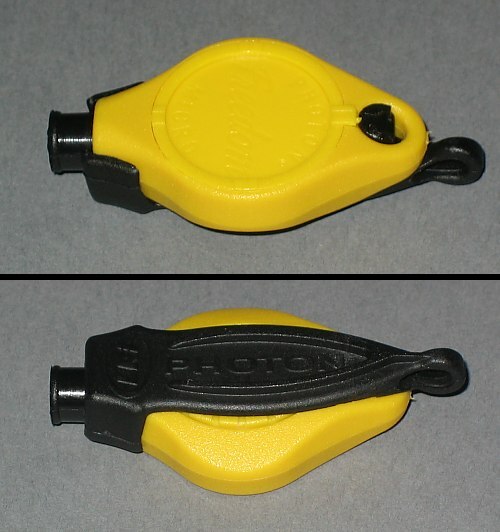 To physically prevent inadvertent activation in storage, such as in a survival kit, you can place the Doug Ritter Photon Freedom Micro in the lanyard's molded Photon Carrier upside down (as shown below), which protects the button from being pressed and doesn't add substantially to the bulk. The light can be popped out of the Carrier one handed, if necessary. The lanyard loop on the carrier can be cut off for more compact assembly. An electronic alternative is to either leave the light in Demonstration Mode (Click here for instructions on how to get the light back into demonstration mode once it's been taken out of demo mode (opens a new browser window)) or to put it into Signal/Morse Code mode. Use your browser BACK command to return to the main page. © 2005 Douglas S. Ritter & Equipped To Survive Foundation, Inc. Check our Copyright Information page for additional information.